C S Narasimha, Bangalore: ‘ I was able to experience the joy of a God-communion in the presence and form of Sri Swamiji’s infinite divine personality for more than an hour’. The word GuRu has two parts to it.. Gu ( Darkness ) Ru ( Light ).. a Guru is seen as someone who leads us from darkness to light. Darkness here is a metaphor for ignorance. We know that Knowledge is the antidote to ignorance. So, another perspective to GuRu is ‘one who is heavy with the wealth of knowledge’. The beauty about knowledge is.. it is not cash or kind that can be taken away from you. Knowledge does not deplete when you share it with others. So, when a Guru dispels ignorance of his disciples by sharing his knowledge, His own knowledge does not diminish. When we say ‘Guru purifies the mind’ we don’t have to see Him like a water purifier. When water passes through a purifier ( filter ), the output water is clean. And the dirt in the water corrupts the filter candle or cartridge. . The Guru’s way of purification is very different. He purifies your mind from within, and He does it out of no compulsion.. just sheer compassion for his disciples. Our scriptures declare that the Guru is ‘beyond the qualities’ and is ‘devoid of form’. So nothing rubs-off on the Guru. He is as detached as water is on a lotus leaf. Since He has discarded desire and despondency ( MMS 79 ) He acquires such dispassion. The water and the lotus leaf do not corrupt one another. So too, the Guru is never corrupted by the muck He cleans up from His devotee’s minds. This is why this MMS declares : Sathguru purifies the mind of the ignorant, but never gets corrupted in the process. The visuals perfectly illustrate the import of what is being said. The ocean is too large and too deep to get polluted by anything that might flow into it. All of this alongwith Appaji’s instrumental music in the background, makes this video a delightful experience. Dear Appaji, Give us the maturity to live life with a detached perspective.. like ‘water on a lotus leaf’. This way we will prevent accumulating muck inside of us. This is what Krishna did to Arjuna in the Gita. This is what we pray you should do for us. A million pranams at your lotus feet..
Sri Sri Sri Swamiji !! I am not sure, that I have this video really. But I think, here is the declaration, that the Guru is helping without make problems of the ignorant to his own problems. That is something which Swamiji said to me once, when I tried to help at some people too much. Helping is important, but I must stay independent. And this I had to learn, because I created big problems. I am therapeut and work with people which have big problems. It is very very important to have some distance to them. I humbly bow to my Sadguru and seek His Blessings to help me to become more detached and imbibe the “water on lotus leaf” characteristic!!! Thank you Appaji for this very very meaningful Video!!! JGDH!!! Jaya Guru Datta, Swamiji. In 1992, during your 50th birthday celebrations, you talked about how all miracles happened within natural law. You explained to us that while some people called the healings you did miracles, it was only that you understood how to control energy without a machine to direct it. Today, you reveal to us another natural principle about Guru that on the surface seems hard for some to understand. But again, you are teaching us how the universe and God work! Please continue to purify our minds so we can more fully accept your lessons and truths! Sri Guru Datta! Water in the video has a tranquil effect. It is our Karma phala that we have Appaji as our Guru. Who gives at all times and takes nothing from us. We, in return, should work hard to make this life worthy, with pure heart and mind. Bless us Appaji. We are forever indebted to your cause. Jai Guru Datta, beautiful video with a soothing music. These daily messages are giving us opportunities to remove the darkness from our mind at every step. Sadguru we pray at your lotus feet that we continue to follow your teachings and do not astray from this path. jgd Dattaguru You are like Aakaasha (Sky). The Sun, The Moon, Stars or clouds just appear and disappear they can not touch You. You O! Smartrugaami remove the ignorance i am thankful to You onhn sgd. Thank you for this beautiful description of Sadguru, who is Parabrahman Himself, the purest ever. Water dissolves dirt and gets polluted. Air picks up bad smells and carries them. But fire purifies all without ever getting contaminated. Sadguru is such Fire. He is also like space that remains untouched by whatever may pass through it, although, we do not hear of space having any cleansing properties associated with it. In today’s lecture during the Ayur-Nada Conference, Smt. Gayatri, the Chemistry expert told us that the fine ash that remains at the end of incineration is weightless. Such is the power of Fire that it reduces to nothing the substances that it purifies. Sadguru does not take upon Himself the sins or the impurities or ignorance of the devotees, He simply reduces them to nothing. Hence He remains absolutely pure. We all hope that by His compassionate efforts we all become absolutely pure and merge in Him. Sri Guru Datta. JGD Appaji! Profound MMS. Lot of thoughts crossing my mind as I write my comment. 1. Cleansing, purification, dispelling our inner enemies, forgiving every action and thought that were not rational, loyal or legal..etc etc..after a point nobody wants to care for anyone, everyone moves away after a point of saturation. Transient relationships, transient people. But You don’t ever cease to care. Why? because of that compassion you have for us, because you treat us as your children, you think you have a responsibility towards us, towards the society at large. Forever indebted to you, oh my guru infinite!! Nothing can ever express my gratitude to you, for bringing me under your umbrella. You are the Noah’s Ark, Appaji!! 3. I have seen people, I myself have been at the receiving end of His cleansing process. I have slowly begun to comprehend his colossal magnificence. The finesse in His teachings, none can escape, they will have to learn. And the cleansing process is so seamless that one has to change (not adapt). I can say from my personal experiences, one should be receptive, willing to be changed, allow that process to heal the inner being. Appaji is an alchemist, trust me!! Santa Claus Appaji, thank you for being with me, conveying your blessings in the most expected and unexpected ways, supporting me in your subtle form. Love you Appaji!! Oh Sadgurudeva, when I look back on how ignorant and polluted my mind was before surrendering to you, I am so amazed and grateful for the clean up. Your work is meticulous and mysterious, the experience of being cleaned is sometimes painful , sometimes subtle, always powerful and uplifting in the end. I pray that you keep cleaning up the filth I have accumulated and I will do my best to stay clean! Thank you for accepting me despite all my faults, Appaji. I love you. Jai Guru Datta. Om namo Hanumate namaha. I recall Appaji’s discourses where His Holiness used to say about this. All forms and all names, and all that exists is the form of Sadguru! Being all, there is no “change” in Him from any act! Million pranams to Sadguru Deva to help us in this path of purification. Sadguru Prabho, like Hanumantha helps every being that tries to utter the name of Rama, please help us as we make attempts to reach Your (subtle) Lotus Feet. Sri Guru Datta. How is development possible? It needs a thorough purification. A replacement of old and impure believe systems. Powerful knowledge. And so much more we have no idea about. Yet all this is given to us by Sadgurudeva alone. He supports us in all these processes. He guides us to obtain more and more freedom. Thank You so much, Sri Swamiji! Dust from Lord Srirama’s feet a stone regained its original nature (Ahalya). We get purified by Our Srirama Sadgurudeva in so many ways !! prevent accumulating muck, with Sadgurudeva’s Grace. Sri Guru Datta Hanuman Ki Jai !! Ohm Namo Hanumathe Namaha !! Jai Guru Datta Sri Swamiji! Thank You for this lovely message! patterns of our thinking and reach our highest potential as instruments of the divine. Sri Guru Datta! JGD. I remember that Sadguru is without desires as such all of His actions result with no karma and so He is ever pure. Please continue with Your cleaning of us, Your devotees, my dear Lord. May Sadguru’s will be done. Beloved Gurudeva, what would i do without Your help, love and compassion. Jai Guru Datta. it is said, As above so below… Please make us strong enough like you to help change the world…. Bridges must be strong…. How can a bridge be a bridege if it is capable of collapsing in the middle or cannot weather a storm? Was he not a monkeyman and a god using the thought of bakti and RAMA mantra? Also, the poorest of society live at the base of the bridge. Thank you very much for the wonderful MMS video. We are all lucky to be under the big umbrella of our Gurudeva. Our Pujya Gurudeva can read our inner most consciousness remove the deep rooted weed called bad thoughts from our mind and once we are purified, nothing can corrupt us again. Thank you Appaji for re-assuring you are always there for us. Jai Guru Datta Swamiji..That is sooo true!!! Sadguru can do ANYTHING and EVERYTHING. HE is like fire, HE never gets attached to anything. HE is the ‘purest’ form of everything. In today’s terminology HE is the ‘Master Copy’/’Original’ for everything, we need to turn for anything. Sri Gurubyo Namaha, Jai Guru Datta, swamiji ,The intensive self-discipline of our sad guru Sri Ganapathi sachidananda Swamiji purifies the mind and spirit through the “burning up” of the desires in our mind. In Bagavad Gita Lord Krishna elaborating that those practicing Karma yoga without desire perform all their actions free from attachments to sense objects and the hankerings for rewards of actions solely for the purification of the mind.A million pranams at our sad guru feet. We are often told that we become like the company we keep. It’s true! Our parents have always asked us to keep good company when we were growing up. While all of us humans are influenced and shaped by our company, the creator is far removed from such influences. God, who is a witness to everything, often takes on a physical body to help us, His children guide and navigate the ocean of samsara. When God assumes a physical form, He is known as Guru. In the process of guiding us, the Guru dispels our doubts, removes our ignorance by giving us knowledge, shows us the way to happiness and slowly and steadily turns our mind towards Godhead. But, the Guru is always unblemished, untainted, uncorrupted. 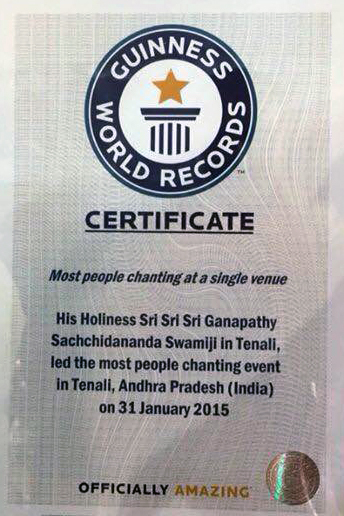 Imagine the millions of people that have come in to contact with Sri Swamiji in the 70 years. In the midst of this ocean of ignorance surrounding Him, Sri Swamiji is the calm, tranquil, steady source of knowledge and joy Who gives as much as we can receive. In fact, thousands and thousands of lives have been transformed with His grace. Who can remain untainted, but elevate the entire population, cities, states and countries around Him? Only the Sadguru! Obeisances to the Lotus Feet of the Sadguru! గుకార శ్చాందకారో హి రుకార స్తేజ ఉచ్యతే ! అజ్ఞానగ్రాసకం బ్రహ్మ గురు రేవ న సంశయః !! మాలోని అజ్ఞానం అను చీకట్లను తొలగించ గలిగిన వెలుతురు మీరు ఒక్కరే గురుదేవ. మీ పాద పద్మములకు సహస్ర కోటి వందనములు. Air – Air is pure and odorless in itself. It is unaffected by the smell or heat/cold of its surroundings. Similarly Guru is untouched by the dualities like joy/sorrow, pain/pleasure, heat/cold etc. and unpolluted by good/bad people around. Fire – Just as fire’s purity is not affected by putting any material in it, similarly Guru is not affected by the offerings from others. He burns down the sins of others. Fire provides light similarly Guru shows the path of dharma for others to walk on. Sky – The air, stars, sun, moon, clouds etc. are all contained in the sky but the sky does not come in contact with any of them. Similarly Guru though is one among the movable and immovable objects, sees himself as Brahaman and is always immersed in Brahma. Sun – Sun evaporates water with its rays and returns it to earth as rain. Similarly Guru can accept material things with his senses and at the apppropriate time gives them to the proper person. Sun and Guru are never entangled by this. Water – Just as pure water cleanses others, so also Guru cleans the entire humanity from selfishness, lust, ego, anger, greed, jealousy etc. with his love, affection, sweet talk and pure touch. Humble prostrations to the lotus feet of Sri Swamiji who like panchabhootas purifies and uplifts us. తండ్రి మా బుద్ధిలోను, మనసులలోను నిండివున్న మాలిన్యాన్ని, కలుషితాల్ని తొలగించి, అజ్ఞానులము ఐన మాకు జ్ఞానపానాన్ని అందించి దప్పిక తీర్ప దివి నుండి భువికి జటాజూటము నుండి గంగను పంపిన ఓ శివదత్తమూర్తి మీ దివ్య పాదకమలములకు అనంతకోటి ప్రణామములు. words not enough to explain the glory of SADGURU. He purifies the mind and gives good thoughts for his devotees good future. JAYA GURU DATTA! I remember Your words, beloved Sadgurudeva ,that You burn us to ashes. One part of this enormous task is to purifie our minds. Endless heartiest thanks for Your inconceivable work! With my humble pranams to Your divinde lotusfeet. S.G.D.! Jaya Guru Datta Puttuji !!! OM NAMO HANUMATE NAMAH !!! Sree Guru Datta !!! HE is the unic Master at work! Perfection in everything He does! How lucky we are that our Sadguru is constantly purifying His devotees even without our knowledge. His grace, His tolerance, His compassion I can’t imagine. Sri Sadguru Maharaj Ki Jai! Helping others or doing any good deeds is possible only when intentions are good. One can have good intentions only when mind is pure. God takes the form of Guru to guide us, to help ourselves by changing our perspective towards constructive good thoughts which is possible only by purifying our thoughts and removing negative thoughts and energy from us. Nice video Puttuji, thank you. Jaya Guru Dutta! Over the last few years, I have experienced this purification process. My understanding of how Sri Swamiji does this is as Puttuji so rightly explained, is from within me. First it was the heightened sense of consciousness and the resultant higher sense of discretion. Next is the analysis that scrutinises every thought, word and action. It feels like I’m actually doing everything in Sri Swamiji’s presence. As I feel it, the purification process is inside out, and it is from an absolutely pure point, driving the impurities to the outer side. So, it is impossible for impurities to get into the source of my purification, which is Sri Swamiji. I have actually once told Sri Swamiji that Sri Swamiji is very strict inside me when compared to instances when I am in Sri Swamiji’s physical presence. Sri Swamiji laughed when I said this. JGD!!! Puttuji guide us to perform our duties with respect, honesty, diplomacy… so that we never get corrupted in the process… SGD!!! Namaste Puttuji, thank You for a pleasant video. Wonderful quote Puttuji. If Sadguru gets corrupted in the process of purification of ignorant people, there is no difference between Sadguru and a common man. In Appaji’s life history, Sri Jaya Lakshmi Mata tells Appaji that He should bring people out of gutter without getting wet. Sadguru is like a lotus leaf, appears it has many water drops on it but it is untouched by them. Namaste Puttuji. Das ist doch, was wir mit DIR, geliebter SWAMIJI erleben: DU gibst uns die Sicherheit, dass wir, wo immer wir auch stehen, von DIR angenommen sind. DU hilfst uns, indem DU auf vielfältige Weise unsern Mind reinigst und nicht auf unser Tun reagierst, indem DU Fortschritt belohnst oder über Versagen enttäuscht bist. Ich danke DIR für DEINE Liebe. Everthing in this creation is pure by itself. Only human beings who have the addition of mind have used it for wrong purposes and corrupted it. Appaji steadily is always pouring the divine nectar in us so that our minds also become purified lik the ocean.We are like rivers which have lot of rocks and mud, rushing and flowing with His teachings, knowing we will one day join the Divine ocean!